Mrs. Barbara Jean Jacobs, age 90, passed away Sunday, March 17, 2019. She was born in Muskegon, MI on October 15, 1928 to Edward & Phyllis (Brown) McMahon and married Max Jacobs on August 23, 1952. 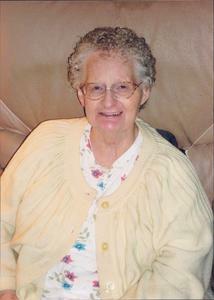 Mrs. Jacobs had been loving wife, mother and grandmother who enjoyed knitting, reading, cooking and bike rides. Daughters, Julia (Garry) Willer, Sally (Bill) Jacobs, Lori Tullis; son-in-law, Jim Coles; grandchildren, Heather (Justin) Eitniear, Sarah (Chris) Bussing, Garry Fred (Becky) Willer, Jacob (Christina) Reyes, Arial (Calvin) Mathews, India Tullis, Max (Ashley) Jacobs, Ben (Sarah) Coles, Michael (Shara) Coles, Jeremiah (Kym) Coles; great grandchildren, Justin Eitniear, Caleb Adrian Eitniear, Gabriella Eitniear, Nate Willer, Natalie Willer-Bussing, Hannah Willer-Bussing, Garrett Willer, Gavin Willer, Emily Willer, Jason Wood, Estee Reyes, A.J. Hoyt, Avion Buchannan, Kiley Jacobs, Austin, Hailey Coles, Miles Coles, River Coles, Ferran Coles, Claire, Lillian, Evelyn; great-great grandchildren, Jozzlynn Eitniear, Hayden Eitniear, Archer Eitniear; special cousin, Yvonne Bialik. She was preceded in death by her parents; husband, Max; daughter, Michele Coles; brothers, Edward & Gerald McMahon & sister, Patricia McMahon. Thursday, March 21, 2019, Noon with visitation 2 hours prior to the service at the Clock Chapel - Muskegon with Rev. John Brown officiating. Interment in Sunrise Memorial Gardens. MEMORIAL: National Kidney Foundation of Michigan.